Scientists at CERN might be on the verge confirming the existence of what they call the "Higgs boson", according to rumors circulating this week. 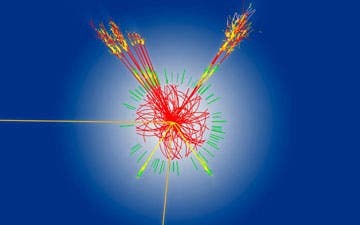 Higgs, they believe, is a particle, or set of particles, that might give others mass. According to Columbia University mathematician, Peter Woit, "CERN will soon have to decide how to spin this: will they announce discovery of the Higgs, or will they wait for some overwhelmingly convincing standard to be met, such as 5 sigma in at least one channel of one experiment? The bottom line though is now clear: there’s something there which looks like a Higgs is supposed to look. Attention will soon move to seeing if this signal is exactly what the SM [Standard Model] predicts (e.g. will the excesses in different channels agree with SM predictions?)." The theory, developed by British physicist Peter Higgs in the 1960s. hypothesizes that a lattice, referred to as the Higgs field, fills the universe. This is something like an electromagnetic field, in that it affects the particles that move through it, but it is also related to the physics of solid materials. Scientists know that when an electron passes through a positively charged crystal lattice of atoms (a solid), the electron's mass can increase as much as 40 times. The same might be true in the Higgs field: a particle moving through it creates a little bit of distortion, which that lends mass to the particle. The question of mass has been a puzzling one, and has left the Higgs boson as the single missing piece of the Standard Model yet to be spotted. The Standard Model describes three of nature's four forces: electromagnetism and the strong and weak nuclear forces. The search has been on for over ten years, both at CERN's Large Electron Positron Collider (LEP) in Geneva and at Fermilab in Illinois. To look for the particle, researchers must smash other particles together at very high speeds. If the energy from that collision is high enough, it is converted into smaller bits of matter — particles — one of which could be a Higgs boson. The Higgs will only last for a small fraction of a second, and then decay into other particles. So in order to tell whether the Higgs appeared in the collision, researchers look for evidence of what it would have decayed into. But finding the Higgs boson will not close the book on particle physics. While the Standard Model accounts for fundamental forces such as electromagnetism and the strong nuclear force, it cannot make sense of gravity, which is disproportionately weak compared to the other forces. One possible explanation is that we experience only a fraction of the force of gravity because most of it acts in hidden extra dimensions. Meanwhile, a new analysis from the BaBar experiment, which ran at the SLAC National Accelerator Lab in California until 2008, suggests the standard model is not what it seems. According to the model, a particle called the B meson, studied by BaBar, decays to produce particles including a W boson, which then decays further into a tau particle and a tau neutrino. Now BaBar reports B mesons decaying into tau particles more often than the standard model predicts. "It looks like the standard model has something in it that we don't understand," says BaBar spokesperson Michael Roney at the University of Victoria in British Columbia, Canada. * The BaBar team's results are not statistically significant, yet, but they hope a Japanese experiment called Belle will confirm their results soon. If it is confirmed, the standard model may need a revamp, even if the Higgs is discovered to fit neatly into it. Image at the top of page shows CL 0024+1654 a large cluster of galaxies located 5 billion light-years from Earth. It is distinctive because of its richness (large number of member galaxies), and its magnificent gravitational lens. The blue loops in the foreground are lensed images of a spiral galaxy located behind the cluster.